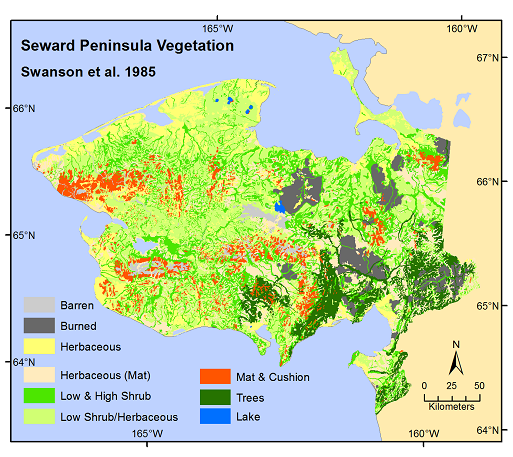 This data set provides two landcover and vegetation maps for the Seward Peninsula, Alaska. These maps were produced from existing maps, Landsat imagery, and color infrared aerial photography covering the period 1976-06-01 to 1999-09-01. Seward Peninsula Landsat MSS Classification: The map developed in 1999 covers the entire Seward Peninsula west of an arbitrary line drawn between the Elephant Point to the north, and the Koyukuk River Delta to the south at 50-m resolution. The legend includes six vegetation classes, water, barren, snow and ice, and shadows. Seward Peninsula Range Map: A vegetation map of the entire Seward Peninsula (includes the Baldwin Peninsula attached to the northeast corner) initiated with Landsat imagery in 1976 and enhanced using the color infrared aerial photography through 1983. The map includes 41 vegetation/land cover units. There are three data files with this data set. The Landsat MSS Classification is in GeoTIFF (*.tif) format, with one layer file (.lyr) which corresponds to the .tif file. The Range Map is in one compressed shapefile (.shp) provided in a .zip file. One companion file, that contains the Range Map information in Google Earth (*.kmz) format, is also provided. Figure 1. Vegetation map of the Seward Peninsula (Range Map, Swanson et al., 1985). This data set provides landcover and vegetation maps for the Seward Peninsula, Alaska. The Seward Peninsula is located in northwestern Alaska and comprises approximately 15 million acres. A wide diversity of land forms, climate zones, and vegetation are found on the Peninsula. The maps were produced from several projects and data sources including existing maps, Landsat data, and color infrared aerial photography. The data cover the period 1976-06-01 to 1999-09-01. Seward Peninsula Range Map: A vegetation map of the entire Seward Peninsula (includes the Baldwin Peninsula attached to the northeast corner) initiated with Landsat imagery in 1976 and enhanced using the color infrared aerial photography through 1983 . The map includes 41 vegetation/land cover units.The vegetation survey was designed to provide information for land resource management with special emphasis on reindeer range planning and management. aga_seward_landcover_thayer-snyder_2000.tif The landcover map Seward Peninsula Landsat MSS Classification in GeoTIFF (.tif) format. The legend includes six vegetation classes, water, barren, snow and ice, and shadows. aga_seward_vegetation_swanson_1985.zip The vegetation map Seward Peninsula Range Map in shapefile (.shp) in compressed (*.zip) format. There are 41 mapping units. These data could be of value to climate change studies. The Seward Peninsula Landsat MSS Classification map was compared to two other maps in Raynolds et al 2002: the Soil Conservation Service Range Mapping (Swanson et al 1985) (SCS) and the Major Ecosystems of Alaska (Joint Federal-State Land Use Planning Commission 1973) (MEA). Results indicated that the precise distribution of the land-cover categories was highly variable. Total agreement between the three maps was not impressive (38.7% between the MSS and MEA maps, and 41.8% between the MSS and SCS maps). The main cause of the relatively large margin of disagreement was most likely due to the comparison between vector based data (MEA and SCS) and raster based data (MSS). An additional factor affecting the low agreement of the maps could be caused by the independently derived land-cover classification systems employed by the creators of each data set (Raynolds et al., 2002). refer to the companion file Raynolds_et_al_2002.pdf for additional information. Please refer to the Swanson_et_al_1985.pdf companion file document. The Seward Peninsula is located in northwestern Alaska and comprises approximately 15 million acres (including the Baldwin Peninsula attached to the northeast corner). A diversity of land forms, climate zones, and vegetation are found on the Peninsula. Bordered by the Chukchi Sea to the north, the Bering Strait to the west, and Norton Sound to the south, the Peninsula is surrounded by relatively cold water to the north and west but relatively warm water to the south. The temperature of surrounding water bodies serves as a large determinant to the distribution of land-cover present on the Peninsula (Raynolds et al., 2002). Vegetation types vary from high-elevation alpine meadows to tidal-influenced marshlands. This is a landcover map of the Seward Peninsula derived from the Landsat Multi-Spectral Scanner (MSS). The map is a preliminary, unsupervised Isoclass classification of a mosaic created by the US Geological Survey EROS Data Center in 1999. The legend includes six vegetation classes, water, barren, snow and ice, and shadows. The map extent is the entire Seward Peninsula west of an arbitrary line drawn between the Elephant Point to the north, and the Koyukuk River Delta to the south. The study area is approximately 50,000 square kilometers. The map was created to supply a detailed land-cover map for two National Science Foundation funded projects: the Arctic Transitions in the Land-Atmosphere System (ATLAS) project, and the Circumpolar Arctic Vegetation Map (CAVM) project (Raynolds et al., 2002). For additional details on the vegetation, landcover, and mapping procedures, refer to the companion file document Raynolds_et_al_2002.pdf. This MSS map was compared to other Seward Peninsula vegetation maps. The Raynolds et al 2002 document also provides very good information from a vegetation survey conducted towards the development of the other maps and the map comparisons: the Soil Conservation Service Range Mapping (Swanson et al 1985) (SCS) and the Major Ecosystems of Alaska (Joint Federal-State Land Use Planning Commission 1973) (MEA). Refer also to Section 4 of this guide document for a brief description of those results. This is a vegetation map of the entire Seward Peninsula (including the Baldwin Peninsula attached to the northeast corner) derived from Landsat data and infrared color photography. The vegetation survey was designed to provide information for land resource management with special emphasis on reindeer range planning and management. The map includes 41 vegetation/land cover units (refer to the table below). In 1976, Landsat data were used to classify and map ecological sites in the northeastern areas of the Seward and Baldwin Peninsulas. Photo-interpretation of high altitude infrared color photography was used starting in 1979 and continuing through 1981, 1982 and 1983. The 1976 area was remapped using the color infrared aerial photography in 1983 (Swanson et al., 1985). Refer to the companion file Swanson_et_al_1985.pdf for additional details. Raynolds, M. K., C. R. Martin, D. A. Walker, A. Moody, D. Wirth, and C. Thayer-Snyder. 2002. ATLAS Vegetation Studies: Seward Peninsula, Alaska, 2000: Vegetation, Soil, and Site Information, with Seward Vegetation Map. AGC Data Report. Swanson, J. D., M. Schuman, and P. C. Scorup. 1985. Range survey of the Seward Peninsula reindeer ranges, Alaska. US Department of Agriculture Soil Conservation Service, Anchorage, Alaska.